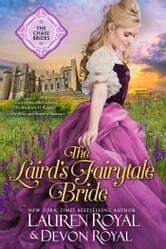 “The Laird’s Fairytale Bride” is the SWEET & CLEAN ROMANCE edition of “Forevermore” by Lauren Royal. Sir Cameron Leslie is used to getting what he wants—and the moment he lays eyes on Clarice, what he wants is to bring her home with him to Scotland. But beneath her shy exterior is a fiercely independent woman, and the closer Cameron gets, the farther she retreats. Can he persuade her to give love another chance before it’s too late? Clarice Bradford is happy with her humble life in a quaint cottage with her daughter. She's a widow with no desire to remarry. That is until she meets a charming Laird, Cameron Leslie. Another great addition to the Chase Brides Series!